More Wang, more weapons, more d*ck jokes, more fun. After two minutes of Shadow Warrior 2, I was growing restless. “There aren’t nearly enough Wang jokes in this demo,” I said with a laugh. “Oh just wait,” my Flying Wild Hog handler replied. And that’s when I came upon my objective, the Demonic Rod—a wood and metal figurine in the shape of...well, I’m sure you can guess. 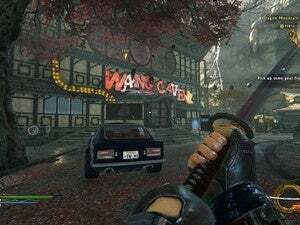 Shadow Warrior 2 is shaping up nicely. 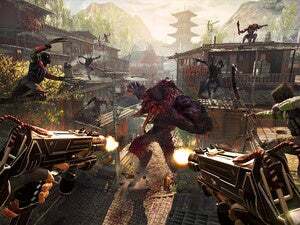 If you didn’t play Shadow Warrior 2’s predecessor, you missed out. Flying Wild Hog’s reimagining of the 1990s classic perfected the whole “over-the-top reboot” thing way before Doom’s recent reboot did. 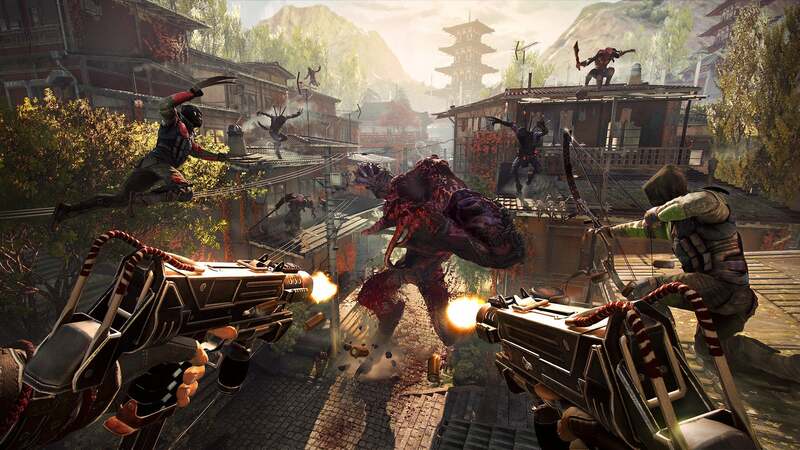 Big guns, bigger bosses—except Shadow Warrior took itself a hell of a lot less seriously. It’s a game I remember fondly, despite some pacing issues. After finishing Doom I even went back to Shadow Warrior because I felt like I needed to keep the adrenaline pumping. So suffice it to say I was looking forward to a sequel, to more of boneheaded protagonist Lo Wang and his demon-wrecking arsenal. And maybe even, if we’re lucky, an encore of Wang’s beautiful singing voice. Straight to the guns, then. I unleashed Wang on a placid city street. Wang and his cohorts actually, as the game features the industry’s latest obsession: Four-player co-op. It’s not my preferred way to play, but credit to Shadow Warrior 2 for a pretty clever method of implementation. Every party member plays as Lo Wang in their own game, but shows up as a generic henchman in the others. Everyone gets the Wang jokes. So we stormed the city streets, and thanks to the magic of “Game Demos” we were playing as a fully-armed and dangerous Wang. A machine gun that shot ice, a chainsaw that carved demons apart, and of course Wang’s trusty sword, along with about a dozen other weapons—each fully customizable. It was a ton of firepower. Way more than necessary, in fact, especially when combined with Wang’s various powers and abilities. The best? The ability to summon spikes out of the ground and impale enemies. Then, while they’re stuck, you slice into them with the chainsaw. This is some good ol’ fashioned demon murder. Shadow Warrior 2 also simplifies its control scheme quite a bit. This time around, powers and special moves are triggered by a single button press, not a crazy combo of buttons like the first game. It makes combat feel a lot quicker and more chaotic. And that’s really the key to Shadow Warrior 2. I mean, aside from the Wang jokes. There’s just this fantastic feeling of speed, of power. You’re not invincible, but you’re definitely the biggest threat in any room. You can get in up close and hack demons with your sword, or take potshots from the nosebleeds. You can scale walls and stealth past groups of enemies or take them head-on. Like Doom, it’s just straight-up fun. When’s the last time you laughed during a modern military shooter? I mean legitimately laughed, not laughed from snark? 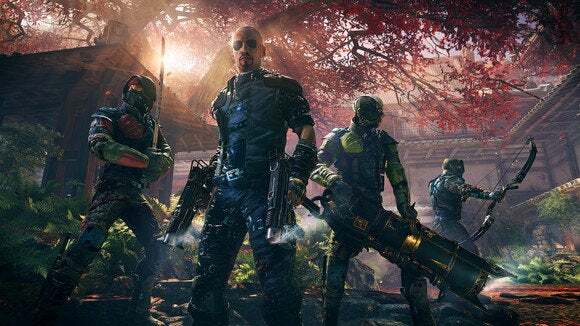 Shadow Warrior 2 knows what it is and revels in it: A solid throwback shooter with a great gimmick and a knack for so-bad-they’re-good puns. There are some important unknowns still to come—levels (or parts of levels) are procedurally generated, and I haven’t seen any of that yet, nor do I know how that’ll mesh with the game’s breakneck pace. But right now? This is one of my most anticipated games for the rest of 2016.